We offer 0% finance on orders over £500 with several deposit options (from 10% to 50% deposit). Applying for 0% finance with Audio Affair couldn't be easier, it only takes a minute and approvals are processed within seconds. 0% finance is available over 6 months (orders over £500), over 12 months (orders over £1000), over 24 months (orders over £2500), or over 36 months (orders over £5000). Finance is a fixed term loan agreement and allows you to spread the remaining cost (after paying your deposit) over 6, 12, 24 or 36 months. We were one of the first hi-fi retailers to offer 0% finance online. Applying is an easy process. Simply order as usual (if you are unfamiliar with online ordering please read our FAQ), and at checkout, if your order is £500 or over, the finance option will show. Select "Finance" and you will be diverted to the finance application which only takes a moment to complete. You can order any single item or combination of items (hi-fi separates, speakers, headphones, home cinema, etc) on 0% finance, providing your order is over £500. Call us on 0121 224 7300 / 7401 and ask for Richard or Joe to apply for 0% finance by phone or if you have any other questions. Alternatively, click here to e-mail us asking for a call back. Feel free to include in the e-mail the list of items you'd like to order on 0% finance to save listing these when we call you back. We'll usually call back before the end of the day (when your e-mail is received during working hours), but will usually call much sooner. Visiting customers can also apply for finance in our showroom. If you prefer to listen before you buy or just happen to be in the area, please feel free to pop into see us (3 Gibb Street, B9 4BF) and we'll be happy to help. On an item costing £1000, you would pay an initial 10% deposit of £100 followed by 12 monthly payments of £75 (the remaining £900 divided by 12). Alternatively, on an item costing £2500, you would pay an initial 10% deposit of £250 followed by 24 monthly payments of £93.75 (the remaining £2250 divided by 24). You can view finance options on each product page and adjust the deposit to change monthly payments. Simply click "MORE INFO" next to the Deko logo. If you prefer a different length of repayments than the examples offered above or have a certain monthly repayment figure in mind, we can offer a highly competitive finance package based around your individual requirements. Call 0121 224 7300 / 7401 and speak to Richard or Joe to discuss a flexible finance package. If you're reading this outside of our normal business hours, please send us a message (remember to list the items you want to order, the monthly repayments you want to make and your contact details) and we'll come back to you! 2) A permanent UK resident for the last 3 years. We can not offer finance if you are unemployed or a student. Your application will be assessed based on eligibility, credit history and affordability and Deko will let you know the outcome in just a few seconds. A hard credit check is made which is recorded on your credit file. 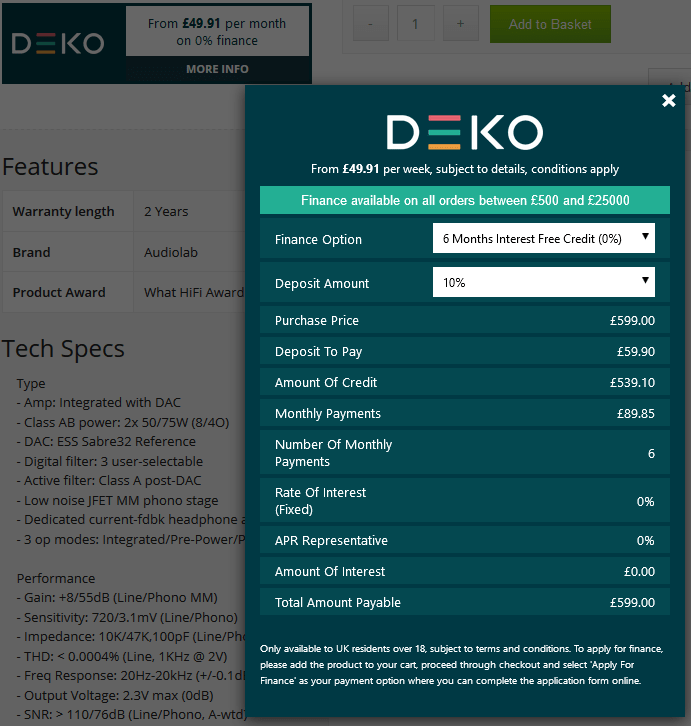 Once approved, Deko will let you know who the lender is and provide you with their contact details. You then just need to digitally sign your credit agreement, pay your deposit and wait for your order to arrive. In some cases, your application may be referred to the lender for manual assessment and you’ll be notified by email of the decision within 24 hours. If you’re not approved for finance it could be for a variety of reasons and the lender will be able to give you more information. Your first direct debit payment will be taken around a month after you receive your order. This will show on your statement as a payment to the lender. You have the right to repay all or part of the loan early at any time. There is a 14-day cooling off period during which you can withdraw from the credit agreement. If you wish to cancel, please contact us, we will cancel the application, arrange for return of the goods, the lender will refund your deposit and let you know of any outstanding balance if applicable. Alexander Michael LTD (T/A Audio Affair) is authorised and regulated by the Financial Conduct Authority (FCA), register number #613316. Finance is provided via the Deko platform. Deko is a trading name of Pay4Later Ltd, registered in England and Wales (company no# 06447333) who act as a credit intermediary and are authorised and regulated by the Financial Conduct Authority (register number #728646). To read more, please visit www.dekopay.com/faq. We can only offer finance on new and some ex demo items (but not on used items taken in part exchange from customers).